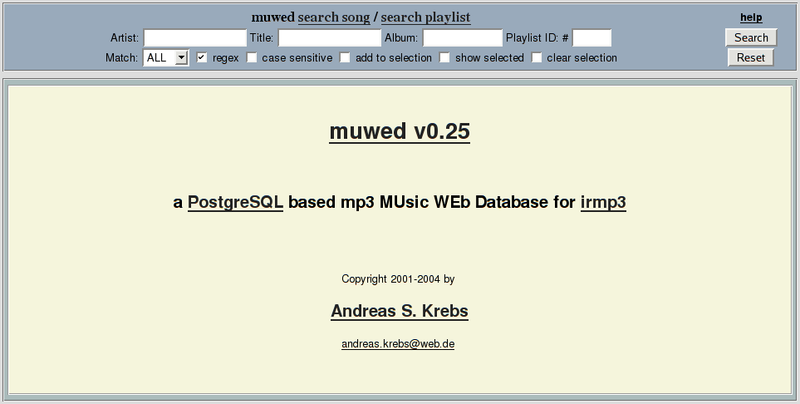 Muwed is a PostgreSQL based database for managing collections of mp3 or other music files, a few perl scripts to fill the database and a PHP web front end to access the database and controll the irmp3 player (a mp3 player daemon that is normally controlled via a infra red remote control - and now also via muwed's web front end). Why did I write muwed? Because no other database with web frontend I know of had irmp3 support ;-). What platforms are supported by muwed? I developed muwed on my Fedora Core 2 linux box, but it'll probably run on any linux or unix system with the required components installed (see README for details). If you manage to run muwed on a system and want it to be listed here send me a mail and I'll add it. Do you still want to know more about muwed? Well here is the README file. Here is also muwed's HISTORY file. Do you want to try muwed yourself? Go ahead and download muwed-0.26.tar.gz. The best of all it's distributed under the GNU General Public License (GPL) and is therefore absolutly free :-). For more details see the GNU General Public License. What versions of muwed are available? muwed-0.1.tar.gz released at 2001-05-16 (initial release). What is new in muwed 0.26? What is new in muwed 0.25? What is new in muwed 0.12? ID3v2 with APIC frame support (see image in screenshot - it's extracted on the fly from the mp3 file). New look & feel - see for yourself. Support for composer and track number fields. Added managment and information web interface. New improved irmp3 web player (requires a patched version of irmp3 0.4.3-pre6). Update and ID3v2 support in add2muwed.pl script. Do you have any comments on muwed? Feel free to send them to muwed@sberk.net.